We are delighted to announce that our Tasting Tuesday format will be back due to popular demand. First theme of the season: Japanese Vegan Food. Japan has a long tradition for including plant based dishes into their everyday cuisine, both being well balanced diet and an ecological friendly way of eating. So whether you are vegan, interested in Japanese cuisine or simply would like to eat less meat, this is the event for you. Nutritious Japanese ingredients are entering the mainstream and we like to celebrate this with a showcase of some of the finest: mooli, tofu, sesame, yuzu, miso and lotus root. 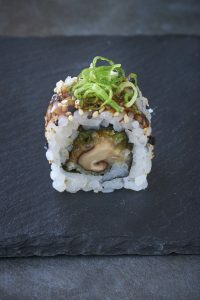 We will serve a selection of Vegan tasting dishes and talk about thier orgin and health benefit.The event will be in the Robata area at Sushi and Robata on the venue floor in Whole Foods Market, High Street Kensington. Please arrive early for a 19.00 start to 20.30. Bookings only via Eventbrite here or via our website: events@sushirobataLDN.co.uk. This is a free event, so hurry whilst tickets last.